The hedgerows are full of bejewelled branches and the garden is offering up the most perfect seeds heads, hips and haws. Hydrangeas are ageing beautifully in the colder weather and a glut of Helichrysum appearing in the borders. The perfect ingredients for a garden gathered wreath. An Autumn wreath from last year. All materials were fixed to the grape vine wreath using a glue gun. I love wreaths and they make the perfect adornment for any front door. I also believe that they should be used all year round and not just limited to the festive season. Autumnal wreaths can take on many forms. Branchy and asymmetrical, hydrangeas bound onto a copper frame or berries and seed heads glued onto a grapevine ring. Following is a little tutorial for my style of Garden Gathered Wreath. 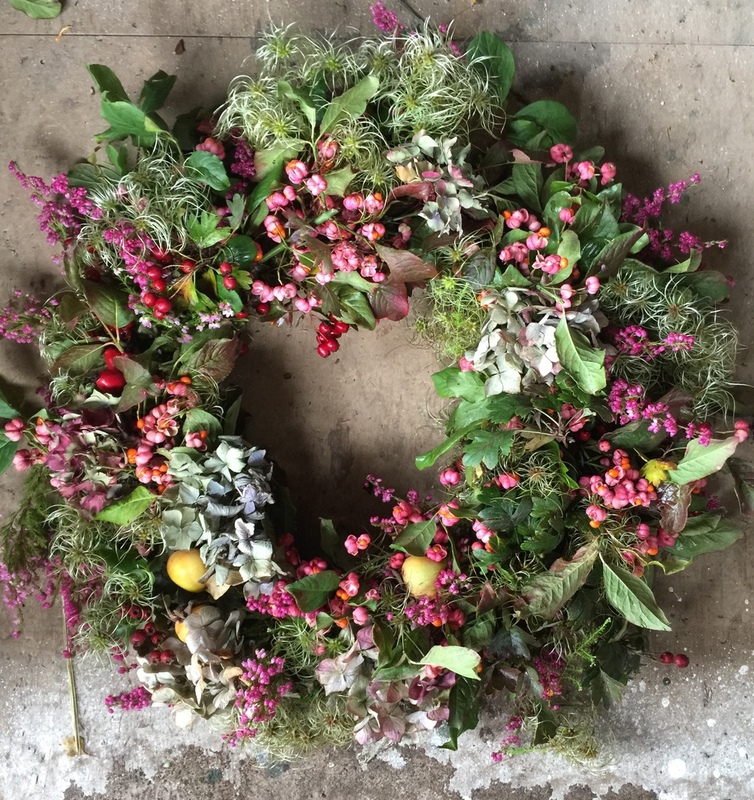 I have gone for a standard shape, laden with Autumnal berries, Rosehips, Heather, dried Hydrangea and Helichrysum from the garden along with Spindle Berry, Hawthorn and wild Clematis as the base foliage. All materials were sourced from the garden or lanes within 100 metres of the house. The only purchase required was the pot of Heather from the local greengrocers. When selecting materials for a wreath, it is always a good idea to go for a range of textures; this gives the final masterpiece more interest. I am constantly looking in the hedgerows for forgeable materials, many of which are overgrown near to the house. Autumn offers the most interesting finds and I always pick up interesting seed heads, dried leaves and fruits to add to wreaths during the winter months. I cannot resist fallen crab apples, hops and 'Old Mans Beard', always taking the opportunity to hoard them in my studio. Start by attaching you reel wire to the outer ring of the copper frame. Make a sausage shape from your moss and push it onto the wire frame. In a clockwise motion, bind the moss onto the frame making sure the wire is secure and not loose. I would recommend that you have a firm moss base, else the wreath will become too loose. Continue to 'moss up' the whole wreath ring, making sure that you do not cut the wire at any time. Leave the wire attached, to continue adding the foliage. It's always a good idea to cut small bundles of foliage etc, so you can make up the wreath continuously - rather than stopping and snipping. I always create three piles of base foliage. Large branches, for the outer edge of the wreath; Medium for the middle section and Small for the inner section. Start by binding your outer section first. I normally use three stems of mixed foliage angled outwards. Once this is bound on, add the middle section of foliage onto the top of the wreath and bind on. Then add the inner section, angling inwards and bind on......continue by adding the next outer section slightly below the previous one and so on. Always work in an anti clockwise motion (very important!) until you covered the whole ring, making sure you cover the mechanics under the last bunches of cut material. Make sure the inner branches for the wreath are small, so you can see the centre; else it will look like a mound of foliage. Once the base has been finished, the reel wire can be cut and pulled through the copper ring tightly; two or three times to ensure that all materials are bound onto the base. Tuck the end of the wire into the moss at the back of the wreath, so it doesn't scratch you paintwork! Extra green material and flowers can be added to fill any gaps, or to add accents of colour. The easiest way to do this, is by hair pin wiring small branches or florets using florists stub wires (I use a 90 gauge wire) and inserting into the wreath. Some dried material or flower heads can be delicate, so try not to be too rough when handling. Insert the wired material into the wreath by pushing into the moss at an angle. Pull the wire through the underside and bend the end of the wire back into the moss, this will ensure that the wired material will be securely attached to the wreath. Once all material have been wired on, tie on some ribbon or wire for hanging the wreath. I am not a huge fan of bows on wreaths and prefer the materials to speak for themselves. Once placed in it's desired position it can be misted and enjoyed for at least two or three weeks. Mist every few days to maintain the green material. Once the materials are past their best, the copper ring can be recycled for later use. Make sure all wire is removed before composting the green material. If you are foraging certain material, please do so responsibly. This year I have been using a black backdrop for a lot of my floral posts on social media. I have actually become a little bit obsessed with it. In January, I began taking pictures on top of our baby grand, which was an aged almost matte black (it has since gone). I then remembered we had this old 1920's fire screen kicking about and it has since become my portable backdrop which I move around the house and garden, in order to capture the best light (personally I am an early morning person). I have always loved Mrs Delaney's paper-cut 'mosaicks' of flowers https://en.wikipedia.org/wiki/Mary_Delany and I guess she was my inspiration to present my flowers in the same way, using cut material, as opposed to cut paper. I love to get up in the morning and see whats about in the garden and then have a bit of creative playtime with the flowers and screen before walking the dog. 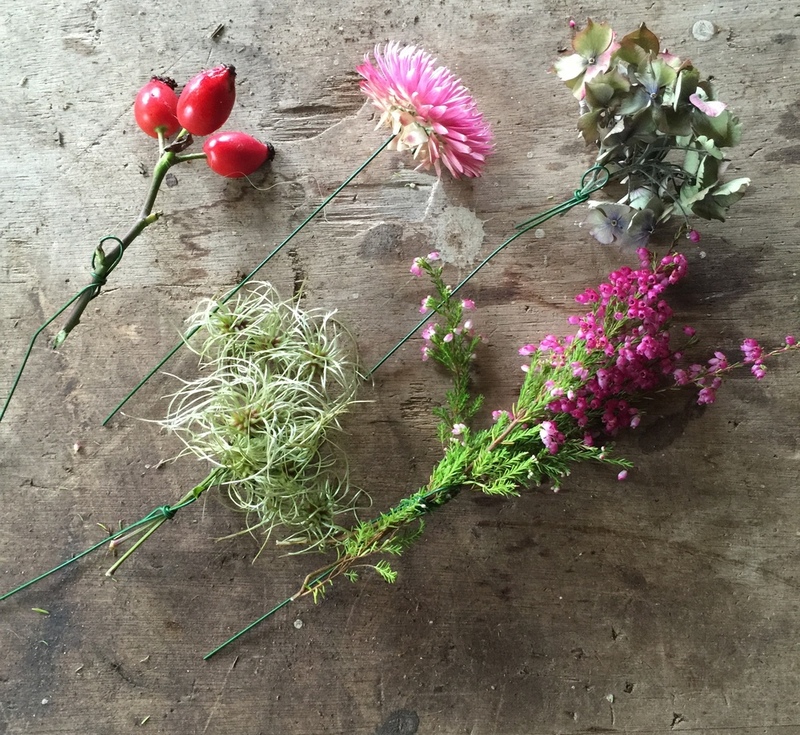 But I am also starting to compile an archive of floral mood boards which will be really useful for demonstrating what is in season at certain times of the year. It is also quite a therapeutic thing to do, before dealing with traffic in the morning! Please note: All flowers are British and grown by my own fair hands. Floating flowers are one of the most enjoyable floral displays to create. It is like something from a Botticelli painting, evoking mysticism and romance. I have recently incorporated them into a lot of floral events and plan to use this creative tool in the future. It is the perfect way to display your blooms from the garden in a different way and if you are partial to a bit of entertaining, it can make quite a show stopper. For sometime, I have been toying with the idea of changing my business name. Originally I operated as Thomas Broom - The Florist. But, when you work in horticulture , people assume that your surname is Bloom. I worked in Japan for a few years and was always called Mr Bloom-san, a Finnish magazine once called me Mr Bloom; in fact everyone calls me Thomas Bloom! It was a no-brainer - The new company would be called Thomas Bloom. Thomas Bloom Ltd, has officially launched today (01/05/2015) and we are looking forward to the future, operating under a new brand name; as we head into the summer full of flowers and floral engagements. I also believe in inspiring people. Over the last few of years, I have spent a great deal of time teaching and inspiring people about gardening and floristry. This is something that I get so much enjoyment from and will be developing more in the future. Garden Gathered will be a tool of inspiration too. It will include how-to guides for floristry, what to sow and grow in your garden and profiles of flowers I adore, including masses of pictures!. Watch this space for updates. So without further ado, I welcome you all to a flowery future with Thomas Bloom.